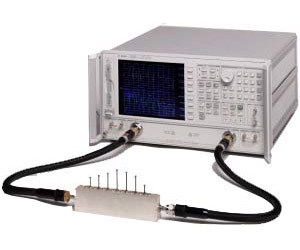 The Agilent 8719ES vector network analyzer allows complete characterization of RF and microwave components. The Agilent 8719ES includes an integrated synthesized source, test set and tuned receiver. The built-in S-parameter test set provides a full range of magnitude and phase measurements in both the forward and reverse directions. Built-in vector accuracy enhancement techniques include full two-port, adapter-removal, and optional TRL calibration.